Just in time for summer, the pretty Alfresco Tasting Terrace on the second floor of Golden Vine Winery at Disney California Adventure park is debuting a new menu and a very cool wine list. There are just 40 seats and you don’t need reservations, so it’s perfect for a small Mediterranean-inspired plate and a delicious sip of wine on the open-air veranda. 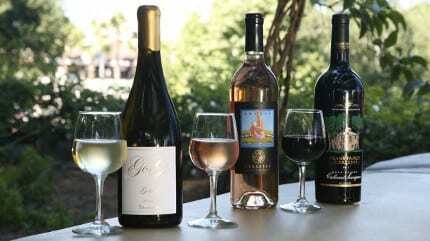 The unique wine list is the only one at any Disney Resort to feature all eight wineries of the “Disney Family of Wines,” a diverse collection that has a personal connection to the Disney name: an artistic talent, a sense of what makes for good storytelling, quintessential family DNA . . . all of the wineries display qualities long identified with Walt Disney and The Walt Disney Company, carrying on the Disney legacy and typifying the passion, innovation and quality that the name Disney symbolizes. Order red, white or rosé by the glass or bottle, or try a featured flight to go with one of these delectable small plates. Guest-pleasing Fritto Misto remains on the menu, a crisp stack of calamari, mussels, green beans, and artichokes with pepperoncini aïoli for dipping. But everything else is new. Try the Aged Cheddar-Risotto Bites with roasted garlic-herb aïoli and marinara. Or the Bruschetta classically topped with fresh tomatoes, basil, garlic and Parmesan. The Charcuterie and Cheese board is perfect for sharing and features Gorgonzola blue cheese, Fontina, Prosciutto Di Parma, Spanish-style chorizo, green olives, marinated mushrooms, walnuts, and dry-cured black Beldi olives. Grilled Shrimp gets a kick with Spanish chorizo. Additionally, there’s a filling trio of Beef Tenderloin Sliders with horseradish and caramelized onion aïoli, and an offering of fancy Roasted Duck Rillettes, similar to pâté, and served with crostini, orange marmalade and buttery Castelvetrano Olives. Sit back, relax, savor and watch the world go by from your second-floor perch. It’s especially delightful after dark, with gorgeous vistas of Ornament Valley inside Cars Land.